Cash Management is a great way for businesses to process payroll. Just a few clicks on the computer from our secure site, and your employees will receive their payroll deposit automatically into their own bank accounts. Its and easy, fast and convenient way to streamline your payroll process. This time saving feature, along with our other useful Online Banking features, will allow your business to handle most of your banking needs, all from one site. 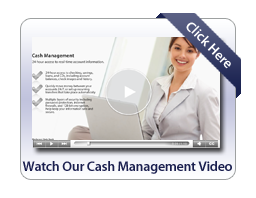 View the Cash Management demo today!